At first I wanted to fill this video with a top 5 list of tips you can use to get rid of knee pain, but then I thought, nah, that actually goes against what I want you to take away from it. Plus I’ve already written about the best tips anyways. There is a way to get rid of knee pain fast, but it’s not about small tips, but rather about a change of mindset. Here’s what I mean. You know what they say. If you want something done properly, do it yourself. The sooner you do it, the sooner you’re done, obviously, right? Then why aren’t we doing it? 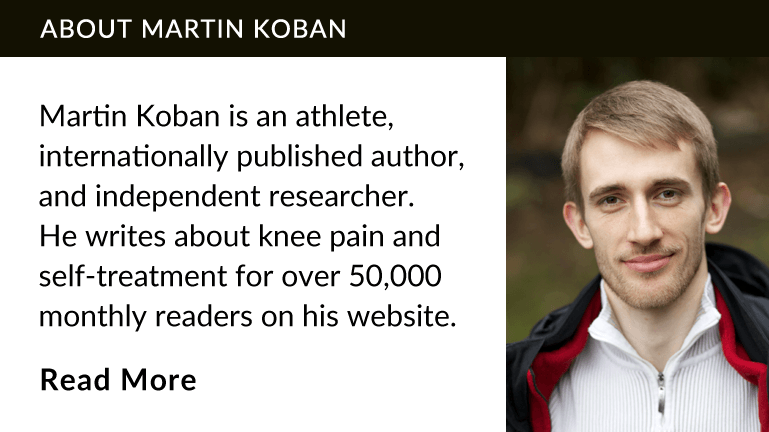 I’ve answered more than four thousand reader emails over the last six years and the biggest mistake people make; the mistake that is keeping them from getting rid of knee pain fast is simply lack of focus. It comes in several flavors. You’ve got folks that try rehab exercises for a week or two and then give up, because obviously it doesn’t work. Well, you know what Yoda said about trying. You’ve got folks that continue running or cycling hundreds of miles per week and then tell me they can’t get better. You’ve got athletes that, quote unquote need to get back to 100% by next month, because they have a competition coming up. I was like that when I had patellar tendonitis and I know it isn’t funny, but the pattern is so obvious. It’s almost like folks are going through 5 stages of grief with their knee pain. First, they’re not willing to accept that knee pain is a problem, the denial stage, so they just keep training and pain keeps getting worse. Most then skip the anger stage and go right to bargaining. They think, hey, maybe if I try a little bit of rehab, it will be enough to get back to sports. Then finally, when enough setbacks have happen and pain has already become a constant in every-day life, they reach the acceptance stage. They accept that they need to take care of their knees, before they can continue enjoying their sports. I’m sure this isn’t what you wanted to hear when you came to this video and I guess a lot of people will give this a thumbs-down, but the truth is this. The fastest way to get rid of knee pain is to skip all these BS stages and go right to acceptance. I guarantee this will save you years of grief. In other words, don’t just try rehab exercises for a couple of weeks, don’t mix rehab with continuing your sport, don’t set unreasonable timelines on your recovery, and don’t quit until you’re done. Instead, make getting back to 100% your sole priority. It’s the main objective you need to work towards. I struggled with this at first, because rehab is boring and slow, but then I forced myself to enjoy the process. I’d tell myself hey, when this is done, you’ll be better than before. You’ll be stronger, quicker, and more resilient. It’s just like Steve Austin in the 6 Million Dollar Man, only that you’re not doing surgery but a really long training montage. Kind of like Rocky, but, well … you get the idea. A training montage is cooler than surgery anyways. We live in a quick-fix world. You can see it everywhere: One trick to lose belly fat fast, another trick to pick up girls, and third trick to make Millions overnight. It’s human nature to fall for these empty promises at least a couple of times until we learn there’s no Money for Nothing. There’s no short-cut to hard work. 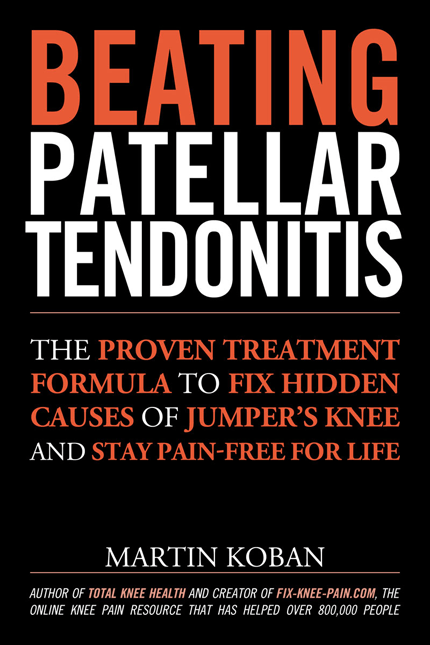 Behind door number 1, you’ll find a list of quick tips to get rid of knee pain. If that’s what you want, check out the 5 exercises I share over at Fix-Knee-Pain.com/unbreakable. If you’re ready for hard work to make your legs strong and healthy again, choose door number 2 and join the 14,700 people that have already signed up for my free advanced course. So what’s the fastest way to get rid of knee pain? Stop getting distracted, buckle down, and get it done.